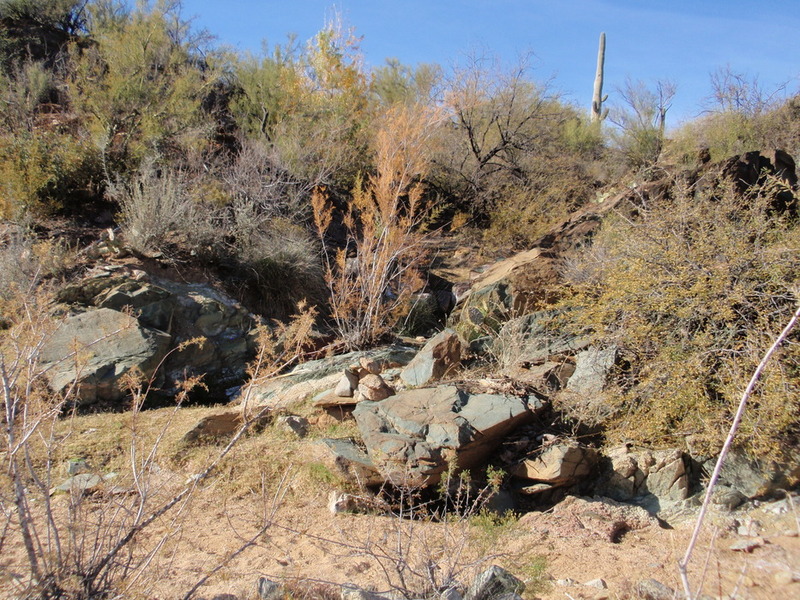 Overview: The Black Canyon Trail is a historic trail which when completed will run from Carefree Highway in Phoenix to north of AZ69 in Mayer, about 78 miles. This section runs from just south of Bumble Bee to Government Spring on Crown King Road at the junction with Yavapai County 179. It gradually climbs to its high point over 3 miles and then follows the ups and downs of the terrain to its endpoint. It is easy hiking on a newly maintained trail (as of Dec 2010) and provides many distant views of the Bradshaws, the Mazatzals and areas between. There are numerous mines in the area with the largest being the Hidden Treasure Mine near the north end. Hike: From the south trailhead it is a short easy bushwack to the trail. I placed a cairn at the north side of the parking area indicating a clear area to walk down into a wash. Cross this wash. I placed another cairn at a pile of rocks (N34 11.838 W112 09.674) where there is a spring. Walk along the right side of this small wash that ends at the spring. In a short distance you'll be able to cross the small wash to the left and reach the trail. You can pick up the trail anywhere along the west side of the small wash so you don't have to be too precise. Pick the easiest path. On reaching the trail turn right. In about .1 miles after reaching the trail, the trail intersects with a two track coming in from the left. Turn right, the trail shortly becomes single track again. Follow the single track up and down and all around enjoying the views and desert vegetation. You'll cross a dirt road at 1.3 miles (N34 12.606 W112 09.518). Continue on the single track. We spotted a building across the valley and wondered whether is was a mine, a home, or a cabin. It had a good road leading to it. You'll cross another dirt track at about 4.3 miles (N34 14.402 W112 10.281) and a third dirt track at about 4.6 miles (N34 14.618 W112 10.383). Soon you'll be able to spot your destination at Government Spring by the large, old water tank in the distance. At 6.08 miles you reach a dirt road (N34 15.296 W112 10.530). From here the trail goes right, crosses Crown King Road and reaches parking at Government Spring. The spring itself is on the south side of the corrals (N34 15.307 W112 10.466) and drains into a tank where some large trees are. If you go left on the dirt road reached at 6.08 miles, it will take you to the Hidden Treasure Mine. There are two large holes here so don't get too close, but it is an interesting place to explore. Northeast of the mine itself appears to be some ruins of water collection and containment constructions. Again, more to explore. This ends this segment. We did it as an out & back but it can be done one way or as a leg of a longer hike. It was a nice hike! Directions: To the south end of trail - Take I-17 North to to exit 248 for Bumble Bee, Crown King and Horsethief Basin. Zero your trip odometer at the end of the ramp. Turn left onto Crown King Rd. Follow this road 5.0 miles (N34 11.671 W112 09.593) to a dirt road on the left before you pass the yellow "Welcome to Bumble Bee" sign. Turn left here, then bear right. Follow this dirt trail about .15 miles then bear left to waypoint N34 11.810 W112 09.658 a short distance further where the road circles around some trees and park. This is not an official trailhead but there is room for several cars. To the north end of the trail - Continue 5.2 miles past the south end of trail parking to a large rusty water tank and parking on the right (N34 15.305 W112 10.511). This is Government Spring and is just before a junction with Yavapai County 179.